U.S. Well Services takes pride in developing new technologies and providing solutions to challenging problems. As government regulations become increasingly strict in the oil and gas industry, the development of new technologies prove immensely important. In that regard U.S. Well Services developed and deployed the industry’s first fully electric, fully mobile hydraulic fracturing fleet, Clean Fleet®, and was granted a patent for this technology in July, 2014. Clean Fleet® is the first, and only, fleet of its kind and is the industry’s most environmentally responsible fracturing solution. U.S. Well Services won the New Technology Development Award at the Northeast Oil & Gas Awards in March, 2015 for Clean Fleet®. The first to utilize SandBox® in the northeast U.S. as a “last mile” sand logistics solution. Utilizes treating iron vibration diagnostics to mitigate fatigue and premature failures of our equipment. Clean Fleet® PowerPath™ technology provides high voltage 13,800 V electrical power for remote hydraulic fracturing operations several miles away. It was first deployed in the Permian Basin for a pad located 2.5 miles away from the power generation turbines. The patent pending PowerPath™ technology allows power generation to be centrally located among multiple hydraulic fracturing pads and to transmit power several miles away via overhead lines to on-site Clean Fleet® pumping equipment. Utilizing high voltage electricity allows the power to be sent multiple miles without power losses that come from low and medium voltage systems. The use of switchgear on both sides of the high voltage highline cables provides important safeguards. PowerPath™ can be utilized to create mobile, long distance micro-grids, to hydraulic pressure pump numerous pads. In addition, PowerPath™ can be utilized to provide power for oilfield equipment such as drilling rigs and other oilfield equipment. Reactive maintenance can be defined as a “run it until it breaks” method of maintenance. Fifty-five percent of maintenance resources and activities remain reactive in nature. The Department of Energy defines preventative maintenance as actions preformed on a time-or machine-run-based schedule, using equipment hours and calendar scheduling to determine whether or not repairs are needed. USWS is leading the way in predictive maintenance, which uses real-time data collected on how a machine is functioning to determine when repairs are needed. USWS developed FRAC MD™ to reduce Non-Productive Time (NPT) and increase safe stages per day by mitigating premature failures of our equipment and maximizing operating parameters. When we listen to what the machines are telling us, we greatly increase reliability, safety, and predictability which all reduces downtime. The real-time data we collect during operation helps determine root causes of failure as well as ways to improve on current methods. The safety of our employees, customers and the enviroment is US Well Services, LLC (“USWS”) number one priority. We are committed to reducing the hazardous risk associated with the inhalation of respirable silica dust on hydrulic fracturing sites. USWS has developed SANDSHIELD™ to mitigate silica emissions below OSHA PEL standards. SANDSHIELD™ consists of specialized equipment, work processes, and engineering controls to mitigate exposure to silica. On November 17, 2015, USWS conducted a silica exposure sampling event on a well pad in Ohio. Three employees wore personal sampling monitors, and these monitors were then analyzed by a testing laboratory. During the assessment, three (3) time-weighted average (“TWA”) samples were collected, one sample each from the breathing zone of three different employees performing different tasks in different areas of the well pad. The following personal breathing zone air samples were collected within the well pad area and were representative of similar processes and procedures. This sampling event was conducted to determine personal exposure levels associated with the hydraulic fracturing process on an active well pad. Based on the results of this sampling event, SANDSHIELD™ provides excellent protection against exposure to silica. OPTI-FLEX™ is a revolutionary slickwater, linear gel, and crosslink replacement product. OPTI-FLEX™ is designed to simplify and extend the capabilities of traditional fracturing fluid systems. Specifically, it is designed to replace slickwater, linear gel, and most crosslink systems. A desired viscosity can simply be reached by adjusting the application concentration of the product. OPTI-FLEX™ can economically achieve target viscosities with a single chemistry by adjusting the application rate at the blender. 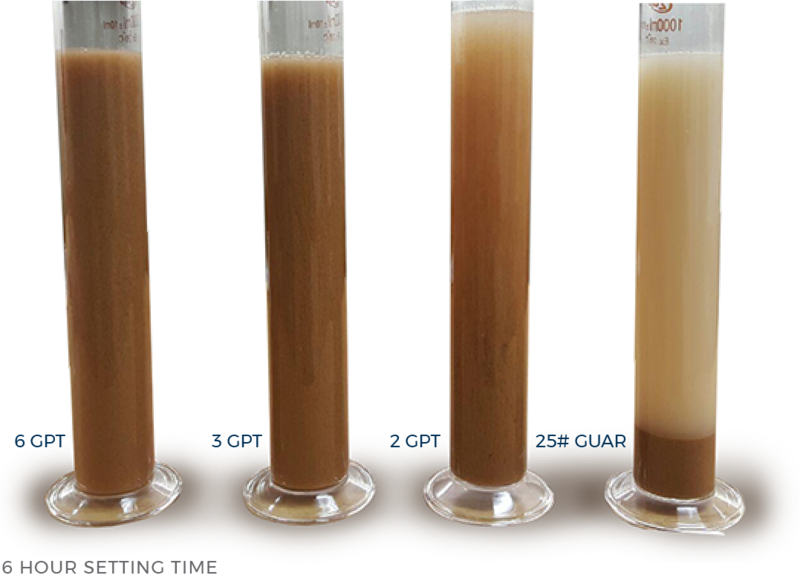 OPTI-FLEX™ works in a wide range of non-produced field waters, has excellent low shear rheology and excellent proppant carrying capacity. Designed to achieve viscosities from 4cP -100+cP in a wide range of field waters. No known compatibility issues with anionic or non-ionic frac chemistries. Normally applied at the blender. Hydration unit is not required for OPTI-FLEX hydration. Excellent hydration in ice water. Excellent proppant carrying and suspension characteristics.